Whoever said that Sweden is a land covered in snow where polar bears roam has clearly not been to the country in the summer. Contrary to that belief, Stockholm buzzes with energy and sunshine during the summer and it’s hard not to get caught up in the enthusiasm everyone seems to radiate. No wonder – come visit Stockholm in November and you’ll realize why every local Stockholmer is smiling in July! Getting around Stockholm is quite a breeze too, as the transportation system is quite efficient and easy enough for first-time visitors to understand. If you’re visiting Stockholm in the summer, the best way to see the city sights is either on foot or by taking the subway. A regular ticket, costs about 200 Swedish kronor and will take you as far as 10 stops. However, if you’re planning to visit museums and commute, the Stockholm Card might be a better option as it also works as a museum pass. Stockholm’s streets are perfect for pedestrians as most any tourist spot can be accessed on foot. So keep in mind that you may have to walk around a lot during your vacation in Stockholm, not that you would mind. With parks like Djurgården or Haga Parken, you’d hardly notice that you’ve been on your feet for most part of the day. The parks are so pretty that you won’t mind spending a whole day walking around in either. You could even cap off the afternoon with a nice picnic together with many local people doing the same thing! Meanwhile, Norra Mälastrand traces along the shores of Lake Mälaren so walking along the path while looking at the lake and the Old Town’s outline is an experience itself. Djurgården – From Centralen, make your way towards Sergels Torg. Hop on the trams near Kulturhuset and you’d be taken straight to Djurgården. Haga Parken – The park is quite big so you could head either towards the Norra (north) or Södra (south). Jump on the train towards the Odenplan station and walk towards the bus station. Look for the 515 buses that are labelled either “Haga norra” or “Haga södra”. Our crown princess, Viktoria, now lives in Haga Parken together with her husband Daniel and their daughter Estelle. They do take frequent walks in the park, so if you are lucky you may see them. Norra Mälastrand – Again from Centralen, jump on the train going towards Rådhuset. From there, you just need to walk a couple of meters to get to the lake. Take the train that goes to Rådhuset and walk towards Norr Mälastrand. Rålambshovsparken is on the right side if you’re facing the water. If you don’t have enough time to visit the real Stockholm archipelago, then at least visit Fjäderholmarna. Fjäderholmarna islands have interesting tourist spots like by-the-water restaurants, an open air theatre, and a street lined with quaint local shops. It is a touristy place for sure, and local people are not likely to be in majority, but they do visit and t least the trip will give you some flavour of our fantastic archipelago. Vaxholm is also a great place to visit in the summer as the island’s pastel-coloured houses look even prettier in the summer sun. The small town features turn-of-the-century buildings which architecture enthusiasts would surely love. If you have more time and the weather is warm and nice, consider a trip to Grinda or Sandhamn. These are longer trips, but you will experience the archipelago for real. My first choice would be Sandhamn – it is a busy island with lots of private boats visiting, a nice beach, nice restaurants and very picturesque. If you want more silence, then Grinda is a better choice. All islands are accessible via ferries that leave from Skeppsbron (to Fjäderholmarna) or Strandvägen (the other islands). From the Central Station, you could take a stroll towards these streets, it is not far. You could also take the subway from Centralen and get off at Kungsträgården station and walk straight toward the docks. 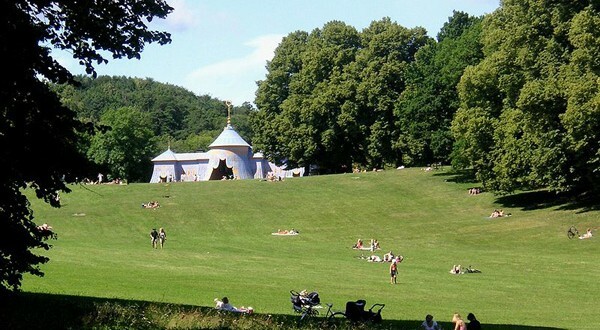 Summer in Stockholm is best spent outdoors so head off to Skansen, the world’s first open air museum and discover how Swedes lived in the olden days. Skansen is also a zoo and a small amusement park (mainly for kids,though). But it is a nice place and great for a picnic. It is also very popular for weddings and you might see a happy bride if you head towards the church Seglora in the middle of the park. In 2012, the renovated and expanded minizoo opened too, so if you travel with kids, this is likely to be a favourite spot for them. Summer in Skansen also means weekly sing-along park concerts called Allsång on Tuesday evenings.These concerts are packed with Swedish artists as well as just ordinary people and they are sent live on TV. Fun for sure, but maybe not the best time to visit unless you want to see the concert. And if you do, you need to book tickets well in advance. One word of warning, based on a really crappy personal experience. Don’t even try to visit Skansen at Midsummer. I’ve done that mistake once and I will never do it again. The lines to get through the entrance were miles long and we actually spent several hours waiting before giving up. If you love amusement parks, Gröna Lund is a great place to visit in Stockholm. It is not a huge amusement park, but filled with attractions and also concerts. If you’re coming from the Central Station, take the trams that are near Sergels Torg. Get off Skansen station. The open air museum is on the left and Gröna Lund, on the right. It may sound very touristy, but even Stockholmers often join varoious walking tours – but usually the Swedish ones, of course 🙂 For tours in English, a good starting point is “Free Tours Stockholm”, but there are others too, especially during summer. You can find more tips on guided tours here at VisitStockholm.com. Foodies, rejoice! Summer in Stockholm features an annual food festival that offers Swedish and international cuisine. Usually held in the first weekend of June, Kungsträdgården square is dotted with dozens of food and beer tents. Most stalls give away samples or sell food at a huge discount so you don’t have to spend so much to sample gourmet delights in Stockholm. There are many festivals going n in Stockholm during summer. In addition to the food festival, there is the Jazz festivals, the Pride festival, Youth festival. Early Music festival, the Cultural festival and many more. Your best bet is to head over to the Stockholm tourist center, called Sweden house, located in Kungsträdgården, address Hamngatan 27 and ask what’s going on.